Due to construction on the BRT corridor, several bus stop changes on International Boulevard will go into effect March 11 affecting lines 1 and 801. The northbound bus stop (toward Downtown Oakland) on International Boulevard at 5th Avenue will permanently close. Board at the stop on International Boulevard at 8th Avenue. The northbound stop on International Boulevard at 8th Avenue is the last stop on International Boulevard. The next stop will be in Downtown Oakland on 12th Street at Fallon Street. The southbound bus stop (toward San Leandro BART) on International Boulevard at 5th Avenue will close. The stop on International Boulevard at 8th Avenue will reopen. 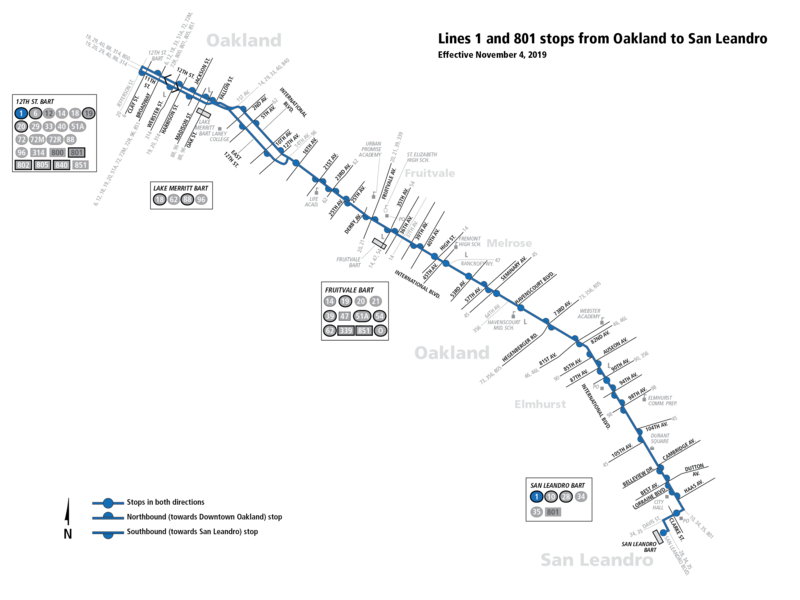 Click here for a map of the current stop locations along East 14th Street; International Boulevard; and Downtown Oakland between San Leandro BART and Downtown Oakland. Debido a los trabajos de construcción a lo largo del corredor BRT, el 11 de marzo se harán efectivos varios cambios en las paradas de autobús de International Boulevard que afectan a las líneas 1 y 801. La parada de autobús en dirección norte (hacia Downtown Oakland) en International Boulevard con 5th Avenue se cerrará permanentemente. Súbase a bordo en la parada en International Boulevard con 8th Avenue. La parada en dirección norte en International Boulevard con 8th Avenue es la última parada en International Boulevard. La siguiente parada será en Downtown Oakland en 12th Street con Fallon Street. La parada de autobús en dirección sur (hacia San Leandro BART) en International Boulevard con 5th Avenue estará cerrada. La parada en International Boulevard con 8th Avenue va a ser reabierta. Haga clic aquí para ver un mapa de las ubicaciones actuales de las paradas a lo largo de East 14th Street; International Boulevard; y Downtown Oakland entre San Leandro BART y Downtown Oakland.